Every Freshwater Cultured Pearl is unique in the world. Each of them owns different luster, color, shape and size. When you look at the surface of them carefully, maybe you can find some defects on them. However, these defects are considered as the evidences to check whether the pearls are real or not. 4*Silver Polishing cloths are an excellent choice for cleaning your sterling silver jewelry. They will remove the tarnish and dullness, keeping your sterling gift like new. We guarantee to repair this 925 Sterling Silver jewelry or any of its components of broken due to defective craftsmanship or material, without any of additional charge. As a company that concentrates on fashion jewelry, we already have about 10 years experience on fashion jewelry trend. We work magic on jewelry, keep on new designs and to a leader of beauty and style is our goal. We have over 5000 products and are good at sustaining innovations. Ever Faith's pieces are those that are bought, worn, collected, cherished and treasured. You will never be regretted if you take some times to look at our store and be surprised to find so many unique design. [! ]EVER FAITH® is a US registered trademark and Ever Faith Jewelry is its only owner. We have SGS Professional Certification for our Sterling Silver Items. Customers could go to a professional agency for testing them. 925 Sterling Silver is also suitable for sensitive skin to wear. All freshwater cultured pearl are the finest pearl, hand picked for its luster, quality, color, and cleanliness strictly and meticulously. Length: 5.7cm(2.2"), Width: 1.3cm(0.5"), One Piece Weight: 6g. 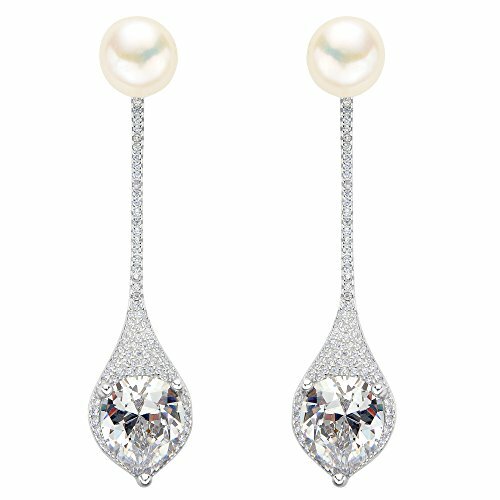 Earring Pearl Size: 9MM. WRAPPING: A Silver Polishing Cloth X A Gift Box X A Favor Bag. If you need assistance please contact us. If you have any questions about this product by EVER FAITH, contact us by completing and submitting the form below. If you are looking for a specif part number, please include it with your message.